FYI: This entire outfit is on MAJOR sale. The promo codes you need I will list below! I love wearing neon in the summer because it enhances your tan, and for a very fair skinned girl like me this is a very very good thing. I also own this particular style skort in white. I love this particular style and the fact that it is a skort makes it easy to throw on and comfortable to wear for whatever you have planned for day or night. My striped top is also currently on sale, I think a navy and white striped top is a closet necessity. I reach for it more than anything else in my closet! 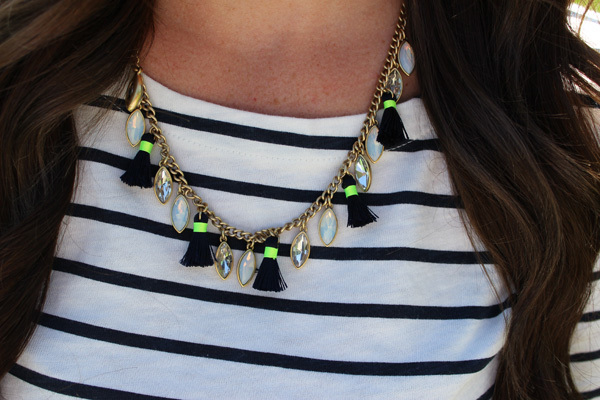 The tiniest hint of neon in this necklace pulls the whole outfit together....I love the powerful effect accessories have on an outfit. They are the one thing I never skip on even my most basic of outfits. Nordstrom: My fave YSL lipstick is on sale right now too! I love the way you styled neon! Keep updated for my Puerto Galera #travelventure part 2.